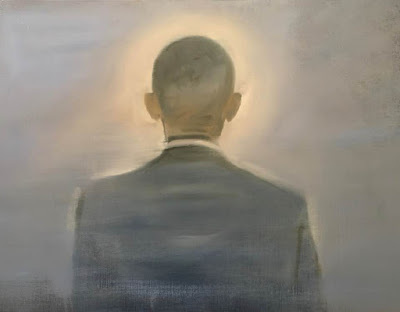 Note to my readers: I was thinking about this exhibit today and thought that I should repost this wonderful article by Jeffrey Carlson from March 2013. In a new solo exhibition, California artist Gregg Chadwick ambitiously explores the boundaries of time and of representational painting. Gregg Chadwick, "Grand Central," oil on canvas, 36 x 48 in. 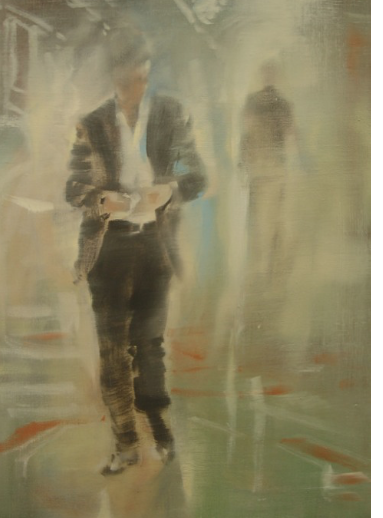 Gregg Chadwick, “Il Poeta di Milano,” oil on canvas, 24 x 18 in. The Time Between, a show of recent paintings by Gregg Chadwick, is now on view at Sandra Lee Gallery in San Francisco. In these paintings Chadwick works lightly and suggestively, as if in the haze of a fragmented vision. 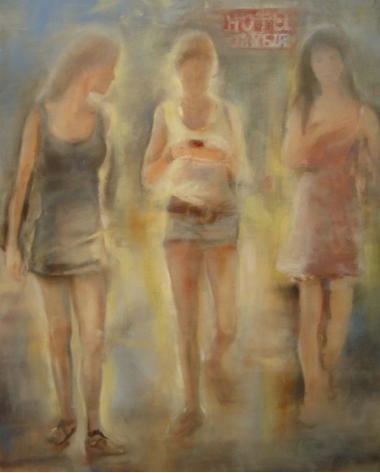 Some figures are located in recognizable time and space, like three young women who stroll an open road, one texting and another snooping. 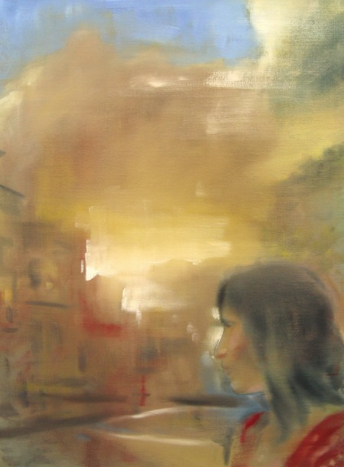 In other works the subject is far more enigmatic, the spaces indeterminate, and the figures distorted or mirrored. 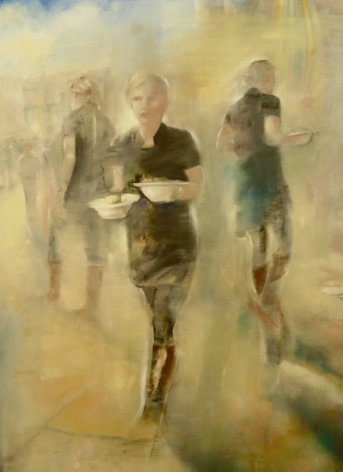 Gregg Chadwick, “I Canti (The Cantos),” oil on linen, 80 x 60 in. Gregg Chadwick, “The Time Between,” oil on canvas, 24 x 18 in. The artist’s conceptual vision neatly dovetails with the goals of the broader contemporary realist art movement. Chadwick paints scenes that are representational yet imaginative; they are, at one and the same time, rooted in tangible existence and removed from it. His figures are real and unreal. Engaged in everyday activities or detached from their surroundings, we see them as women and men of the world and as specters of superhuman existence. Gregg Chadwick, “Three Secrets,” oil on canvas, 30 x 24 in. Based in Santa Monica, where he paints in an old airplane hangar, Chadwick has shown at galleries and museums nationally and internationally. He earned his BFA from UCLA and his MFA from NYU. 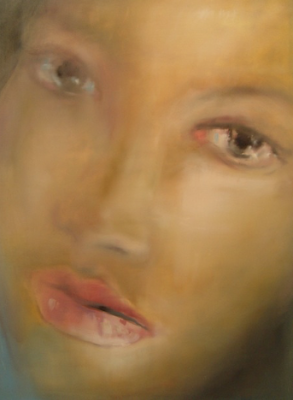 Chadwick has held notable solo exhibitions at the Manifesta Maastricht Gallery (Maastricht, Netherlands), AD Space 2000 (Tokyo, Japan), and the Lisa Coscino Gallery (Pacific Grove, California), and he has participated in group shows at the Sandra Lee Gallery, Arena 1 Gallery (Santa Monica, California), and the Arts Club of Washington (Washington, D.C.). 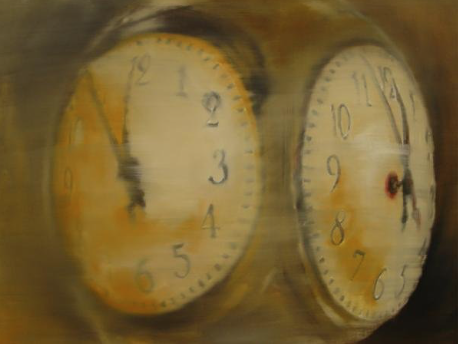 Chadwick writes a blog, Speed of Life, in which he examines art’s intersection with society. He also frequently posts recently completed work to his Flickr account, which can be viewed here. The Time Between will be on view through March 30, 2013. An opening reception will be held the evening of March 7, from 5:30‐7:30 p.m. Sandra Lee Gallery is located at 251 Post Street, Suite 310, in San Francisco. For more information, visit www.greggchadwick.com and http://sandraleegallery.com. Gregg Chadwick, “Proserpina,” oil on canvas, 48 x 36 in.